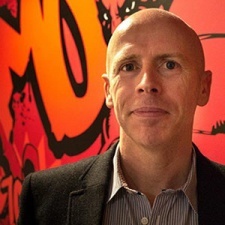 Sheffield-based work-for-hire specialist Sumo Digital's employee count has risen 33 per cent to 650 since its IPO at the end of 2017. That's according to the company's FY2018 financial release, in which Sumo says it employed 650 people at the end of the financial year in March 2019. 487 people were working at the developer at the end of December 2017, a figure that rose 21 per cent to 592 the following year. A further 27 members of staff joined with the acquisition of Red Kite Games in January 2019. Speaking of M&A activity, Sumo Group CEO Carl Cavers (pictured) says that the company is keeping an eye out for further acquisitions. It also sounds like Sumo is going to be very busy in the coming years, with the top exec saying that it has had a lot of companies vying for the work-for-hire specialist's services. In fact, Cavers says that 88.7 per cent of the firm's development fees already contracted or close to being signed off. Two of these are for Apple's new Arcade subscription service, with another two deals also signed. The company is keen to not entirely be reliant on work-for-hire contracts, however, with industry vet and non-executive director Ian Livingstone contributing to the IP Creation Committee. One title is coming to Apple Arcade, referred to as Spyder. The last IP that Sumo created was Snake Pass, which reportedly has returned around 130 per cent of its investment, as of the end of 2018. At the end of 2017, it had made back 83 per cent of its investment, meaning that 2018 saw Sumo recoup 47 per cent of cash it splashed on the project. Sumo says that buying The Chinese Room has sped up its plans for own IP creation. “With the video games market forecast by Newzoo, a leader in games analytics, to grow around 30 per cent in the next three years, driven by demand for new cloud-based subscription platform content supported by the world’s biggest publishers, we believe that the outlook for Sumo Group is as good as ever. We are successfully attracting major new global publishers, as well as strengthening our relationships with existing and previous clients, and our business development pipeline remains very healthy," Cavers told investors.